Down for the count: The Bust is primarily a bad baseball card site (and a site for bad baseball cards), but we have occasionally featured other sports. Soccer, hockey, tennis and even rowing have made appearances over the years. So has wrestling just not the kind that offers monthly pay-per-view specials for $44.95. This week, we're righting that wrong and digging up some of the finest superstars the then-WWF had to offer in 1990. Good God almighty! It's a pop quiz smackdown: Which of these descriptions best fits the man on the above card? 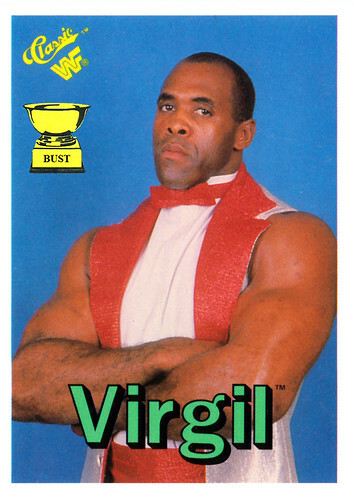 (A) Virgil was a Chippendale dancer who never heeded management's advice that he should shave his arms. (B) Virgil was an ancient Roman poet whose greatest works included the epic "Aeneid." (C) Virgil served as a bodyguard for Ted "The Million Dollar Man" DiBiase, and was later known as Vincent and, somehow, Curly Bill. (D) Virgil is the loneliest man on the Internet.